If patients have risk factors for periprosthetic femur fracture, strict investigation of the aetiology of the suddenly onset restricted full weight-bearing is very important in prevention strategy. Department of Orthopaedic and Traumatology, Ankara Numune Training and Research Hospital. Turkey. Introduction: Periprosthetic fractures of the femur are uncommon, but at times may lead to complications especially in elderly patients. As treatment of these fractures is difficult, prevention by identifying the risk factors is the best way to overcome these complex problems. Case Report: A periprosthetic right femur fracture associated with a neglected left femoral neck fracture in the contralateral femur in a 78-year-old elder woman patient is reported in the present article. We discuss the prevention of periprosthetic fractures after hip arthroplasty and address the risk factors associated with this complication. Conclusion: The present case emphasizes the importance of investigating and treating the cause of sudden onset of restriction on full weight-bearing in the contralateral limb, to prevent periprosthetic femoral fracture after hip arthroplasty in elderly patients. Keywords: Periprosthetic fracture, neglected femoral fracture, hip arthroplasty. Periprosthetic fracture generally seen in frail elderly patients with osteoporosis is one of the most devastating complications of hip arthroplasty [1,2,3]. In literature, risk factors associated with periprosthetic fractures are still under debate and investigation [1,3,4,5,6]. Female gender [1,5], implant design , higher number of comorbidities [1,5], old age [3,5] and cementless implants [1,3] were suggested to be the risk factors for periprosthetic fractures. However, the results of the previous studies are contradictory and a consensus about the risk factors has not been reached yet. Whatever the aetiology, the present case addresses the importance of sudden onset of restriction on full weight-bearing in the contralateral limb after hip arthroplasty in elderly patients. We report a case of a periprosthetic right femur fracture associated with a neglected contralateral left femoral neck fracture in an elderly patient. A 78-year-old woman suffering from generalized right leg pain applied to the outpatient department. From her medical history; she underwent total hip arthroplasty six years ago after being diagnosed as having primary osteoarthritis of the right hip. After surgery, she had not reported any problems about her right hip arthroplasty. Suddenly; she had restriction on full weight-bearing in her contralateral left side for seven months. She was prescribed painkillers by her general practitioner and started using a walking stick. Her relatives said that there was no specific trauma that could explain sudden onset of restriction on full weight-bearing in her contralateral left side. They criticized the general practitioner for not investigating her left side pain meticulously. We had no X-ray records of the patient during her application to general practitioner seven months ago. While she was walking for seven months after restriction of full weight-bearing of left hip, she had a fall after stumbling on the carpet, and was admitted to the outpatient department of orthopaedics for evaluation of severe right hip pain. The antero-posterior radiograph of the pelvis revealed Vancouver type-C periprosthetic fracture of the right femur and a neglected femoral neck fracture in her left hip (Fig.1). 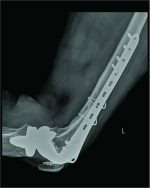 According to the information gathered from her and her relatives, it was a simple fall that could not explain such a catastrophic periprosthetic fracture in the absence of any predisposing factor such as contralateral full weight-bearing for months. The patient was 78 kg, 165 cm tall with a calculated body mass of 28.65 kg/cm2. She had undergone total hip arthroplasty with expansion cementless acetabular cup and cemented femoral prosthesis previously. 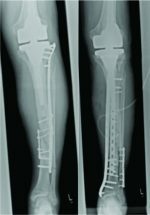 After surgery, she had been followed up regularly for three years once a year and there was no complication such as significant leg length discrepancy or rotational abnormalities. Later she was lost to follow-up as she had no complication during those three years. She applied to outpatient department with periprosthetic fracture of the right femur and a neglected femoral neck fracture in her left hip. Pre-operative routine procedure was done by planning revision arthroplasty of the right hip. The only comorbidity was well-controlled blood pressure. C-reactive protein level and erythrocyte sedimentation rate were in normal range. She underwent revision arthroplasty of the right hip by using the previous anterolateral incision [modified Watson-Jones]. Both acetabular and femoral components were removed. Cementless acetebular cup with constrained polyethylene liner and 40 mm proximal body, 12/160 mm distal stem of fully porous coated long femoral prosthesis was implanted during revision surgery (Fig 2). Five dall-miles cables were used to stabilize the femoral component. There were no post-operative complications and the patient was ambulated with partial weight-bearing on the left side and as much as she tolerated on the right side with the aid of a walker on the third day postoperatively. Hip musculature strengthening physical therapy was applied during her follow-up. Although total hip arthroplasty was offered for neglected contralateral femoral neck fracture, patient and her relatives were not keen for a second operation due to advanced age of the patient and also because she had relatively less complaints with her left hip. Weight-bearing had been increased incrementally during the follow-up of six and twelve weeks. The patient was ambulated with full weight-bearing six months after surgery. After seven months of neglected contralateral femoral neck fracture, patient was encouraged for weight-bearing on that side as much as her pain allowed her to bear. During regular follow-ups, she continued to have restricted weight-bearing in the contralateral side and was consistently reminded of the necessity for a total hip arthroplasty for that side at each follow-up visit. Prevention of late periprosthetic femoral fracture is suggested to be best accomplished through routine follow-up and intervention of risk factors [7,8]. Identification of the underlying reasons can show a reasonable way for interventions to reduce the risk of such fractures. However, predisposing factors for periprosthetic femoral fractures are still a matter of debate due to the contradictory results of the previous studies [1,3,4,5,9]. Singh et al. found that female gender was associated with a higher risk of postoperative periprosthetic fractures. Cook et al. suggested that there was no association between the occurrence of periprosthetic fractures and gender, and two other studies supported the results of this study [4,9]. Conflicting results were reported concerning the age. Sarvilinna et al. concluded that age was not associated with an increased risk of periprosthetic fractures. While Cook et al. emphasized an increase in periprosthetic fracture rates with increasing age; Sarvilinna et al. suggested a decrease with age. Franklin et al. evaluated the risk factors of periprosthetic fractures in their review article and stressed the debated results in the literature. As mortality and morbidity rates after periprosthetic femoral fractures are seriously high, it is important to identify more accurate and unarguable risk factors for periprosthetic fractures. To our knowledge, there has been no case report of periprosthetic femoral fracture after neglected contralateral femoral neck fracture in English literature. In the present case, as an unarguable risk factor for periprosthetic femoral fractures, excessive loading of osteoporotic bone was not taken notice of, by neglecting the contralateral femoral neck fracture. Yun et al. suggested that periprosthetic femoral fractures were associated with contralateral hip diseases such as degenerative arthritis in the presence of lysis around the femoral component. Based on their results from five patients with previous total hip arthroplasty, they recommended timely elective hip surgery for the contralateral hip in case of restricted use of the associated limb secondary to degenerative diseases . Besides all the debated risk factors mentioned above and degenerative diseases of the contralateral hip, sudden onset of loss of weight-bearing of the contralateral limb is an absolute risk factor for periprosthetic femur fractures via increasing stress over the osteoporotic bone. The present case supports the suggestion of Yun et al. and addresses the importance of pathologies in the contralateral hip if there is a history of total hip arthroplasty especially in elderly patients. As a result, in case of non-weight bearing of the contralateral limb, we recommend activity limitation in patients until the aetiology is found and treated. Excessive loading of osteoporotic bone, restriction of full weight of contralateral hip due to neglected fracture or osteoarthritis of hip, lysis around the femoral component may cause periprosthetic femoral fractures. We strictly advise meticulous investigation of the cause of a sudden onset restriction of full weight-bearing in the contralateral limb to prevent periprosthetic femoral fractures after hip arthroplasty in elderly patients. In the elderly patients, sudden onset restriction of full weight-bearing in the contralateral limb should be meticulously investigated to prevent periprosthetic femoral fracture if the patient has/had previous hip arthroplasty history. 1. Singh JA, Jensen MR, Harmsen SW, Lewallen DG. Are gender, comorbidity, and obesity risk factors for postoperative periprosthetic fractures after primary total hip arthroplasty? J Arthroplasty 2013;28:126-131. 2. Hou Z, Bowen TR, Smith WR. Periprosthetic femoral fractures associated with hip arthroplasty. Orthopedics 2010;33:908-916. 3. Cook RE, Jenkins PJ, Walmsley PJ, Patton JT, Robinson CM. 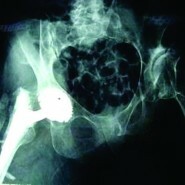 Risk factors for periprosthetic fractures of the hip: a survivorship analysis. ClinOrthopRelat Res. 2008;466:1652-6. 4. Sarvilinna R, Huhtala HS, Puolakka TJ, Nevalainen JK, Pajamäki KJ. Periprosthetic fractures in total hip arthroplasty: an epidemiologic study. IntOrthop. 2003;27:359-61. 5. Singh JA, Jensen MR, Lewallen DG. Patient factors predict periprosthetic fractures after revision total hip arthroplasty. J Arthroplasty 2012;27:1507-12. 6. Lindahl H, Garellick G, Regner H, Herberts P, Malchau H. Three hundred and twenty-one periprosthetic femoral fractures. J Bone Joint Surg Am. 2006;88:1215–1222. 7. Franklin J, Malchau H. Risk factors for periprosthetic femoral fracture. Injury 2007;38:655–660. 8. Harris B, Owen JR, Wayne JS, Jiranek WA. Does femoral component loosening predispose to femoral fracture? : an in vitro comparison of cemented hips. ClinOrthopRelat Res. 2010;468:497-50. 9. Sarvilinna R, Huhtala HS, Sovelius RT, Halonen PJ, Nevalainen JK, Pajamäki KJ. Factors predisposing to periprosthetic fracture after hip arthroplasty: a case [n = 31]-control study. ActaOrthop Scand. 2004;75:16-20. 10. Yun AG, Dorr LD, Long WT. Periprosthetic femoral fractures associated with contralateral hip disease. J Arthroplasty 2005;20:957-9.